I was originally scheduled to leave for Michigan yesterday for a week long visit. My brother's wedding is next Saturday and I usually go for a week in the summer to see family and friends anyway. But now that I'm adopting - I decided to shorten up the visit. For two reasons - to save money on rental car and pet care by making it less days. And two - to use M-W days off to get some adoption related stuff done that I need to do during the day. So I'm not leaving until Thursday. And my sweet best friend and her hubby ended up offering up their 2nd car while I'm there so I won't have to rent a car at all which saves like $175. So sweet of them! So Monday, I have my full physical and my doctor will fill out all the paperwork needed to declare that I'm healthy and can raise a child with no physical or mental issues. Tuesday I have my first home study appointment. I have the application all filled out and will turn in the first $900 that day. That is half of the cost and it's due up front. Monday, I will also mail a signed and notarized contract to my adoption agency. I sent my application in last week along with the application fee. Now, it's the contract that is due. I received a ginormous binder in the mail Friday from my agency filled with pretty much everything I need to know. If you try to go through the entire thing at once, it's a little overwhelming but they have it organized really well and it walks you through what you need to do and when. I'm not sure when I get the official "referral" on my boy but I'm trying to work as fast as possible on my end to get what I need to get done so that I'm not the one holding anything up. I also have a trip to India for work in a few weeks and I'll be gone for 10 days so praying I have all that I need to get done finished before I leave so that while I'm gone - no one is waiting on me for anything. Each step of the way takes time and even though they give you estimates on how long that will be - it's just an estimate and it's better to hold those timelines VERY loosely and just wait until you get the word that you're on to the next step. I can do that. God is in control and I'm just trusting Him! In the meantime, I am thankful to have met a few girls who are helping out at my boys orphanage and one of them has kept in touch with me via facebook. She loves him and he loves her and I know he's being looked after. That makes me have a huge sense of peace in knowing he is well loved and cared for during the wait time. I can only imagine the turmoil I would feel or other adoptive parents feel when they have to wait and their kids are not in a good situation during that wait. Thanks to some amazing women of God who have moved to Africa to help at his orphanage - the kids there now have a very good environment to be in while they wait for their families to get the approval. Praying for all those families who are adopting - that their wait will be minimal and their children well cared for and loved in the meantime. As I wait, I have lots to do by means of paperwork and appointments and research. I want to be as educated as possible about being a mom and especially about things that a child could experience from 1) being adopted and 2) being from another country. I also need to find a good pediatrician and my friend Katie's little boy from AFrica goes to one she loves so I'm gonna check her out first. She also had a contact for a doctor that can read international medical reports cause I need one of those too. So it's nice that they have gone through this process and can share some of their resources with me. I'm about to pick a weekend to do a yard sale and so if you're reading this and you have items you'd like to donate for me to sell at the yard sale - let me know. I'm collecting items and hoping to have a huge yardsale to raise additional funds. A fundraiser concert is also in the works so stay tuned for details on that. On a side note - I am going to buy my friends child's toddler bed that will eventually convert into a headboard for a twin bed. 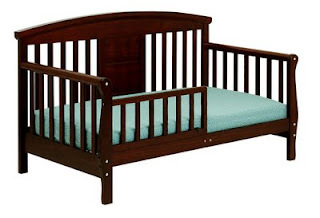 I think it can also be a crib too. They are getting a new set and will be selling theirs and it's literally exactly what I would have wanted - all dark wood with a high back - this isn't the exact one but it's pretty similar. I won't get it for a few months but I'm excited to know what it's gonna look like so I can start looking for matching pieces. My grandma is also going to make a quilt and some valances for the windows which is exciting!!! I'll do some paintings to match the quilt. I'm wanting to do jungle theme since we'll have the tree of love in there with all the leaves that have people's names on them. I thought it'd be cute to do monkeys and giraffes and zebras too. I sent my grandma some samples of styles I like so we'll see what she comes up with. So fun to think about decorating his room! Even more exciting to think about bringing him home. Praying, praying, praying for God to continue to open doors, give me direction and wisdom and be with me every step of the way. And most importantly to keep my little boy safe and healthy and well loved in the meantime. Thanks for all the support and prayers everyone! I so greatly appreciate it. You are a part of this journey - and so many people are literally helping me to bring him home with generous donations and purchases from the blog store. I feel so blessed! Thank you! So excited to read this update!! I am so happy for you. Love ya! Hey! A friend of your mentioned you might be interested in having your fundraiser added to my Shop To Save. If so, please let me know!